If you haven’t yet started on your taxes, then you’ll need to get going! 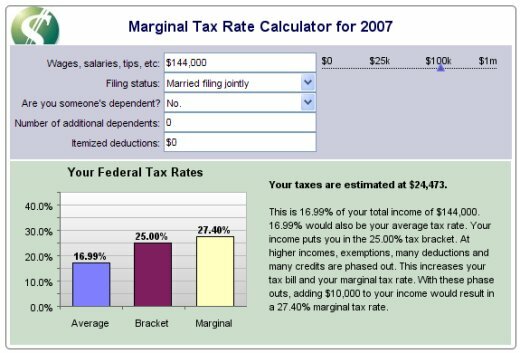 To help you out, I’m publishing the 2008 and 2007 Tax Bracket Tables (or Tax Rate Schedules) below — as seen in this AOL page — to use as a quick review for figuring out your taxes. But take note that the top set of tax rate schedules are for Tax Year 2008 while those further down are for 2007, which you should be using to file your current tax return (the one due this April). Though most of us rely on tax software, spreadsheets, a CPA or Enrolled Agent to get our taxes done, the following is a simple illustration of how we use the figures in the tax rate tables to calculate our federal tax bill. So in this case, you’d owe the government $24,472.50 in federal income taxes this current tax year (2007). But here’s a quicker way to figure it out — these tax calculators can do it for you! You can plug in your values using this tax estimator or this marginal tax calculator. For instance, try plugging in a gross income of $144,000. Given the assumption that you take 2 exemptions — one for you and one for your spouse, this example yields a taxable income of $126,500 with a tax bill total of $24,473. The average tax rate in this case is 16.99%.